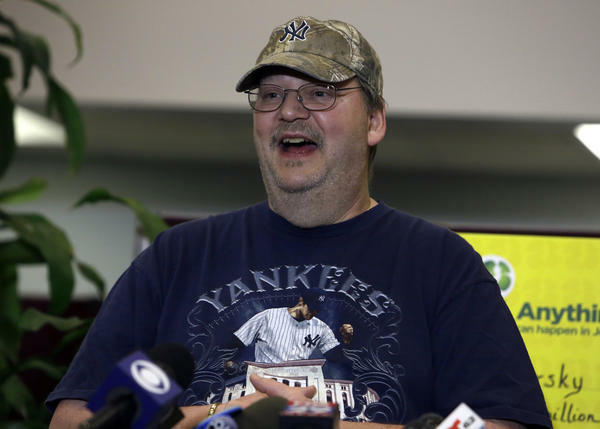 Mike Weirsky, a New Jersey man who left his $273 million jackpot-winning Mega Millions lottery ticket at the store where he bought it, says he's going to reward whoever returned it. Then, he said he was distracted by his cellphone — and left the tickets behind. "I put the tickets down, put my money away, did something with my phone and just walked away," he told reporters on Thursday. Before the drawing, he says he looked for hours for the tickets at home, then returned to the store to see if they had them. To his surprise, he found that somebody had handed them in the day before. The cashier "made me explain what I bet and what the tickets were, and she handed them to me, and I walked out." On Sunday night during a snow storm, Weirsky got around to checking his numbers — and realized he was holding the winning ticket. He remembers sitting and watching TV for half an hour after that, just stunned at what had happened. "I just didn't believe that it was me, after all these years of playing, I finally had something that said, you're a bigger winner than $2," he said. He's spent $20 per week on tickets, on and off, for years. "I'm just very thankful that there's an honest person out there, because I figured it was gone," he said. Now, he's trying to find the person who turned in his tickets at the store. "I'm going to give him something," he said. "I'm going to keep that private." A store clerk named Phil Campolo told NBC that he's the one who turned them in. "My parents raised me to be a good person, honest, sincere. I was doing the right thing, and I'd do it again." James Carey, the executive director of the New Jersey Lottery, says if that person had kept the ticket for themselves, they would have been able to claim the winnings. "If you think about it, it's very difficult to say who owns a lottery ticket, short of someone coming in here and saying, 'I purchased this ticket, it's mine,' " he said. Weirsky says his luck has changed in another way too. He hasn't worked for years, and for the past year had been unable to secure even a job interview. "Yesterday I got my first interview," he says, "It's just a miracle." He says he doesn't intend to take the job but will possibly start a business with family members. Now he plans to buy a pickup truck for himself, a car for his mother and remodel her house. He also wants to take his family on a vacation. "I always wanted to know what it would be like to just wake up and decide to go somewhere, go buy something, just do it. When I get the money I'm going to do that, I'm going to try that," he said. Weirsky plans to take the money as a lump sum of $162 million, rather than in installments. The grocery store, QuickChek in Phillipsburg, got a $30,000 bonus check for selling the winning ticket.